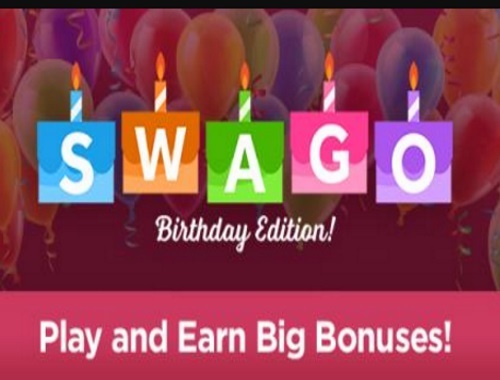 Canadian Daily Deals: Swagbucks Birthday Swago & Swag Code Extravaganza: Birthday Edition! Swagbucks Birthday Swago & Swag Code Extravaganza: Birthday Edition! Swagbucks is celebrating their birthday all day on February 27, but they want to give YOU presents. You can play Swago (their version of bingo) all day long, filling out squares as you earn points on their site for doing things you already do online. Swagbucks is celebrating their 9th birthday also with a Swag Code Extravaganzas, which is one of the easiest ways to earn SB! What are SB you ask? SB are points you earn on Swagbucks, a website where you can get gift cards for the things you do online. The celebration begins on Monday, February 27 at 12am PT and goes all day long! All you have to do is look out for the Swag Code notifications, enter the code, and you earn SB (which can be redeemed for gift cards)! There will be 9 Swag Codes throughout the day worth a total of 50 SB! Look out for the Swag Codes all over Swagbucks!